Lionsgate's released some new information about its Judge Dredd reboot, including a 2012 release date. It's been a good sixteen years since Sylvester Stallone's Judge Dredd mangled the beloved British comic character on the big screen. That said, there's been a lot of positive buzz around Lionsgate's Dredd reboot, which is getting a lot of attention at this week's Comic-Con. From the sound of things, this is going to be a much more faithful portrayal of the comic character and it looks like fans are going to have to wait at least another year or so before the reboot hits theaters. Dredd takes us to the wild streets of Mega City One, the lone oasis of quasi-civilization on Cursed Earth. 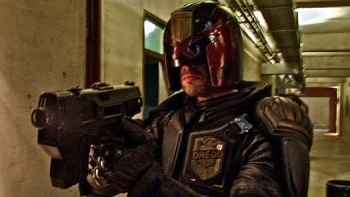 Judge Dredd (Karl Urban) is the most feared of elite Street Judges, with the power to enforce the law, sentence offenders and execute them on the spot - if necessary. The endlessly inventive mind of writer Alex Garland and the frenetic vision of director Peter Travis bring Dredd to life as a futuristic neo-noir action film that returns the celebrated character to the dark, visceral incarnation from John Wagner and Carlos Ezquerra's revered comic strip. Lionsgate has also revealed that the movie will storm theaters, both in 2D and 3D (groan), on September 21st, 2012. Between the above screenshot, the fact that Karl Urban is playing the lead role (that man is watchable in anything, even Priest), and the impressive rÃ©sumÃ© of screenwriter Alex Garland (he wrote 28 Days Later, Sunshine, and Never Let Me Go), it looks like Dredd's second visit to movie theaters might be the one that wins over audiences.